A vision of gleaming gold, Wynn Las Vegas adds the look and feel of luxury to the Las Vegas Strip skyline. Along with its upscale shops and restaurants, the serene environment incorporates scenic gardens, a man-made mountain, a 3-acre lake with a mesmerising waterfall, a golf course, atriums and skylights. The extravagance of nature and design extends throughout the Wynn. Rooms in the high-rise hotel tower are designed to provide views of either the Las Vegas Strip, the resort’s 18-hole golf greens or the waterfall. 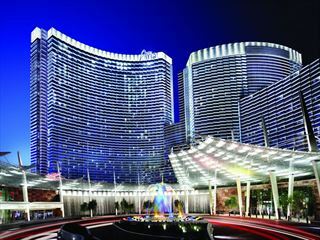 This luxury resort and casino is located on the Las Vegas Strip. 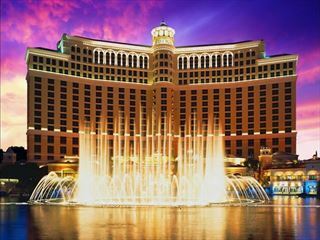 approximately 30 minutes drive from the Las Vegas International Airport. 2,716 rooms and suites. At the Wynn Resort it’s easy to mistake any of the rooms and suites for a stylish apartment in Manhattan, London or Rome. And while you’re here, it’s yours. ALEX - If you’ve ever dined on the French Riviera, you’ve had a taste of the exquisite flavours of Alex. WING LEI - A decadent twist on early French-influenced Shanghai, the dramatic decor at this elegant restaurant is as unique as its sumptuous Chinese cuisine. SW STEAKHOUSE - Offers a wide variety of charred, prime-aged steaks and chops, as well as poultry and seafood specialties. DANIEL BOULUD - Celebrity chef Daniel Boulud joins with rising star chef Wesley Holton to bring their vision of the quintessential French brasserie to Las Vegas and only to Wynn. BARTOLOTTA - celebrates the traditions of Italian coastal cuisine, with fresh seafood and shellfish flown in daily from Mediterranean waters, as well as homemade pastas and classic Italian specialties. RED 8 ASIAN BISTRO - A casual bistro serving authentic Southeast Asian cuisine. STRATTA - An open fire hearth, convivial bar and lounge scene and ideal proximity for convenient pre and post show dining make Stratta a popular spot for a casual yet stylish dining experience. TABLEAU - Savor expertly prepared regional fare including some of the best steaks, chops and seafood Las Vegas has to offer. THE BUFFET - Sixteen live-action cooking stations and a sumptuous array of extraordinary dishes will redefine your notion of buffet dining. TERRACE POINTE CAFÉ - This sunny and spacious dining café offers a wide variety of coast-to-coast American favourites and terraced seating overlooking lovely gardens and pools. ZOOZACRACKERS - The best self-serve New York style deli this side of the Hudson River. CABANA BAR & CASINO - Hotel guests 21 or older can enjoy a quick bite or a cool drink while trying their hand at blackjack. THE CAFÉ AT THE DRUGSTORE - Serving a wide array of espresso and coffee drinks and everything from classic breakfast pastries and pick-me-up desserts to savory sandwiches and salads. SUGAR & ICE - At Sugar and Ice, seven different signature burgers allow you to satisfy your burger craving every day of the week. Indulge in a breakfast treat, savory sandwich, coffee or pastry. Or nestle near our magnificent waterfall with an irresistible homemade ice creams or sorbets. Wynn Las Vegas boasts beautiful, heated pools artfully positioned amid manicured gardens. On the main level, there are two spacious pools, a European-style bathing pool, two Jacuzzi spas and the Cabana Bar, with its cool concoctions and poolside blackjack (in season only). One level up, guests staying in the Tower Suites can enjoy two quieter pools and food service from Tableau. Personal cabanas are also available to be reserved. All pools are exclusive to Wynn Las Vegas and Encore guests. Pool hours change seasonally. Blush Boutique Nightclub - Blush transforms into an energetic, sensual club on Tuesday, Thursday, Friday and Saturday nights from 10pm to 4am with renowned resident DJ Mighty Mi spinning an eclectic mix of music. Tryst - The Wynns newest nightclub Tryst, is truly a breathtaking atmosphere, even for the seasoned Las Vegas party goer. Dominated by gorgeous design elements such as a lagoon and waterfall. The nightclub is intimate and relaxed. LE RÊVE, presented exclusively at Wynn Las Vegas, offers breathtaking performances in an intimate aqua theatre-in-the-round. The show features aerial acrobatics, provocative choreography and artistic athleticism. Live music and elaborate special effects immerse the audience into a world of fantasy, adventure and intrigue. TABLE GAMES - Located on the main casino floor, Wynn Las Vegas’ selection of table games includes Baccarat, Black Jack, Big 6, Carribean Stud, Roulette, European Roulette, Let it Ride, Mini Baccarat, Pai Gow Poker, Three Card Poker, and Casino War. POKER - The twenty-six table poker room offers a variety of games and limits to suit all levels of play. Test your skills and luck with Hold’em, Omaha Hi-Low, and mixed game combinations.